Collins Precision Dental is a team of internationally qualified dentists, conveniently located right in the heart of Melbourne. With years of training and expertise, we offer highly-targeted and effective solutions for patients suffering from Sleep Apnea. Sleep apnea is a common sleep disorder in which you have one or more pauses in breathing or shallow breaths while you sleep. Some patients will have episodes where they are seen to stop breathing during sleep. Breathing pauses can last from a few seconds to a few minutes and may occur 30 times or more in one hour. Don’t suffer alone. Contact a member of our sleep apnea treatment Melbourne team today to find a solution that’s right for you. Typically, when normal breathing resumes, this can sometimes begin with a loud snort or choking sound. However, sleep apnea is often present even when stopping of breathing is not been seen. Your breathing is affected when the muscles that control the upper airway relax too much during sleep. This causes the upper airway to narrow and you may begin to snore. If the airway narrows even further, it may become completely blocked and you temporarily stop breathing. This ‘obstructive’ apnea can last for ten seconds or more, it may happen frequently and even several hundred times a night. 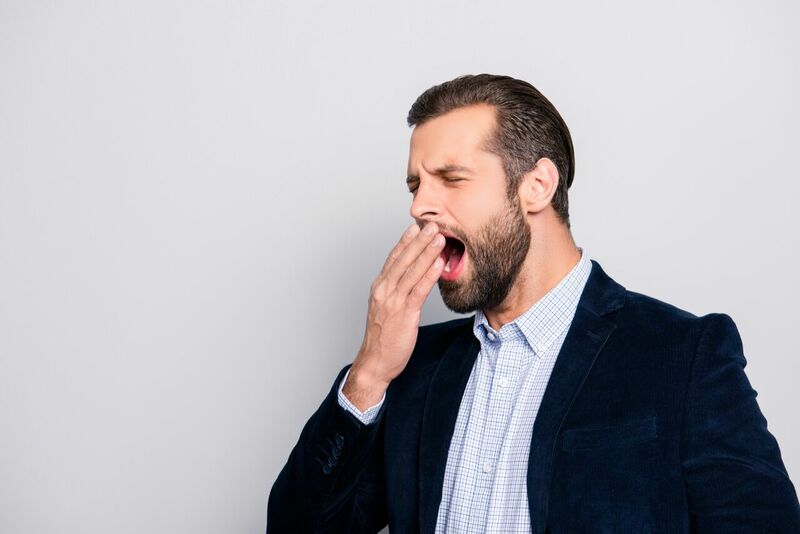 Around 5% of men and 3% of women have sleep apnea that is severe enough to have negative effects on their health, causing sleepiness, high blood pressure and increased risk of cardiac disease and diabetes. Given how common sleep apnea is, and the negative effects it has on health, sleep apnea is important to look for and treat if present. A healthy night’s sleep is very important for your overall health. Sleep apnea can be diagnosed if there are episodes of gasping or choking during sleep. The role of further evaluation and treatment is to work out why someone has sleep apnea, what effect it is having on their health, and what treatments are best suited to them. These are questions that we can help you with at Collins Precision Dental. Here is a list of some of the symptoms you may experience if you are suffering with sleep apnea. For those with severe sleep apnea, the aim of the treatment is to improve sleepiness during the day and also to reduce the negative effects of sleep apnea on blood pressure, heart function and diabetes. For those with mild sleep apnea, the aim of treatment may be to reduce the noise of snoring. Therefore, it is important to know the severity of sleep apnea and its effects on health to develop and appropriate treatment plan for each individual. At Collins Precision Dental, we offer a number of different services and treatment options that can help treat sleep apnea. Reduce overall cardiovascular risk: As sleep apnea increases the risk of cardiovascular disease, patients with sleep apnea should actively reduce their overall cardiovascular risk with smoking cessation, blood pressure treatment, reducing cholesterol, improved physical fitness and weight reduction. Reduce alcohol: sleep apnea is worsened by muscular relaxation that occurs during sleep and is worsened by the muscular relaxing effects of alcohol. One of the treatment choices your doctor can prescribe is a custom made Mandibular Advancement Splint for you, such as a SomnoDent. Devices in the SomnoDent family of products treat OSA moving the lower jaw slightly forward. A SomnoDent device gently and non-invasively adjusts the forward movement of your jaw, which in turn opens your airway to help you breathe easily and sleep restfully. This optimal position of the jaw prevents the patient’s airway from collapsing during sleep. Worn during sleep, continuous open airway therapy is a first line treatment option for people with mild to moderate OSA and consists of devices that have two components which fit over the upper and lower teeth. These oral devices are comfortable and simple for patients to use which is why many patients prefer COAT therapy to other options. COAT is also a viable option for those who do not respond well to other treatment options. Oral appliances are useful in treating sleep apnea and usually well tolerated. The best candidates for an oral appliance are those who are not obese and have mild or moderate sleep apnea. If you’re struggling with sleep apnea, don’t wait for symptoms to get worse. Our team of qualified dentists can help you find the solutions you need. Speak to one of our professionals here at Collins Precision Dental about Sleep Apnea treatment Melbourne on (03) 9654 5705.